wait a few minutes until the researcher returned with a second marshmallow, and eat them both. Most kids, left in an empty room with just a marshmallow for company, caved within just a few minutes. Only a few were able to successfully delay gratification long enough to win a second marshmallow. The tests also showed that kids who focused on the marshmallow – keeping their eye on the prize, so to speak – were least able to resist. In contrast, kids who successfully resisted used a variety of distraction strategies, like singing songs, dancing, or covering their eyes so they wouldn’t be tempted. Could YOU resist these delectable homemade marshmallows? The most amazing part of the study was that researchers followed up with the kids in their test, and discovered that those who could delay gratification to win a bigger sugary prize also had higher SAT scores, more successful careers, and fewer instances of drug or alcohol abuse. In other words, the ability to sacrifice immediate satisfaction in order to achieve a larger, longer term goal is a huge advantage in ALL aspects of life. The marshmallow research is still ongoing, but recent studies have added a twist. 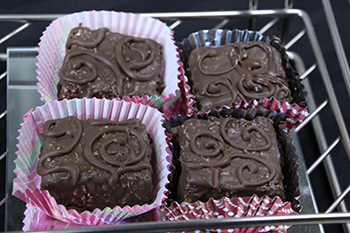 Before tempting kids with the treats, researchers established two environments, one reliable and one unreliable. Kids who learned that the researcher could be trusted to deliver on promises resisted for an average of 12 minutes and 2 seconds. Kids who’d been disappointed by unfulfilled promises decided to go for the sure thing – they ate the marshmallow 9 minutes sooner! Click through for more details on the Marshmallow Tests. What about you? Are you a “marshmallow in the hand” kind of person, or do you find it easy to stay focused on your long term goals? What strategies have you developed to resist temptation? The Marshmallow Test was just one of the amazing studies I read on the link between our brains and our body weight. 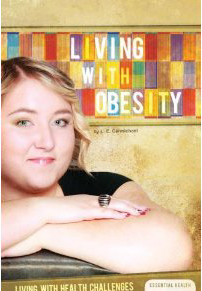 The best of them made it into Living With Obesity, which I hope will support and empower any teens who are facing weight-related health issues.